There are a wide variety of battery technologies available today, ranging from the traditional lead-acid battery to the latest lithium polymer (LiPo) batteries. For the most part, your application will dictate the type of battery you use. In some cases you may have to decide between battery types when more than one would be suitable for you application. Batteries seem like they should be easy to use, just hook them up and go. In fact you can usually do just that but chances are you won’t be satisfied with the resulting charge duration or battery life. Batteries can easily be abused if you don’t fully understand their specs. Some battery chemistries are more tolerant of being abused than others but any abuse tends to shorten battery life. Each battery technology has its own unique set of characteristics and many of those characteristics vary based on the environment they are in, how they are used and for rechargeable batteries, how they are charged. To a large degree and for the sake of this discussion, you can model a battery as a fixed voltage source connected to the load through a variable series resistor. There are a number of things such as temperature, load and age that act on this variable resistor to decrease the battery output. Nominal voltage – My advice to you is forget you ever heard the nominal voltage spec for the battery you are working with. Nominal voltages generally reflect a certain point in the battery’s discharge curve under conditions your battery may never see in the real world. For example, a LiPo cell has a nominal voltage of 3.6V but its operating voltage range is from 4.2V to 3.0V. As you can see in the discharge curves below for a LiPo battery, under a light load (the blue line) the curve flattens out around 3.6V just before falling off the cliff. Other than this short period of time, it would be hard to correlate anything on these discharge curves to 3.6V. The two critical voltages you need to be concerned with are maximum voltage for charging and the rated cut-off voltage for discharging. To get the full life of your batteries, these two voltages should never be exceeded. Factors effecting output – Load and temperature are the primary factors that create the discharge curves for rechargeable batteries. In the case of load, the variable resistor in our battery model acts much like any other resistor and the output decreases as the load increases. Temperature appears to make this variable resistor act the opposite of a real resistor, as the temperature decreases the apparent resistance increases, reducing the voltage at the output. The combination of a heavy load and low temperatures can result in a considerable decrease in the output voltage. 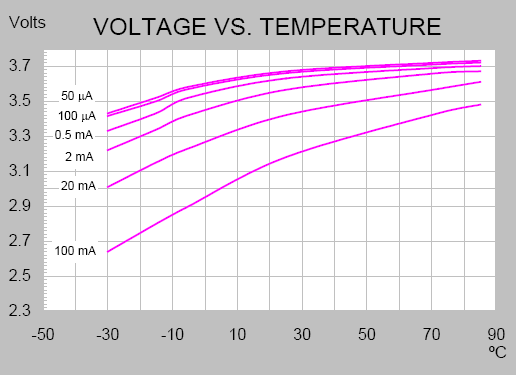 As shown in the graph below, the output of a LiPo battery can decrease by over a volt from light load at high temperature to a heavy load at low temperature. For non-rechargeable batteries, the age of the battery also impacts the voltage. As these batteries get older (whether they are in use or not), the apparent resistance increases causing the output to decrease. Discharge curves – All battery technologies have a characteristic discharge curve, typically plotting voltage against mAh capacity (or age). 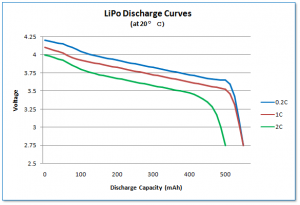 While useful for comparing battery chemistries, once you select a battery technology you need to look at the discharge curves for specific battery models. Variations on the chemistry and battery construction from manufacturer to manufacturer yield different discharge curves. Specifically, you need to pay attention to the curves for the load you expect to place on the battery and the temperatures you expect your product to encounter. These two factors can have a significant impact on the charge duration your batteries will have in actual use. 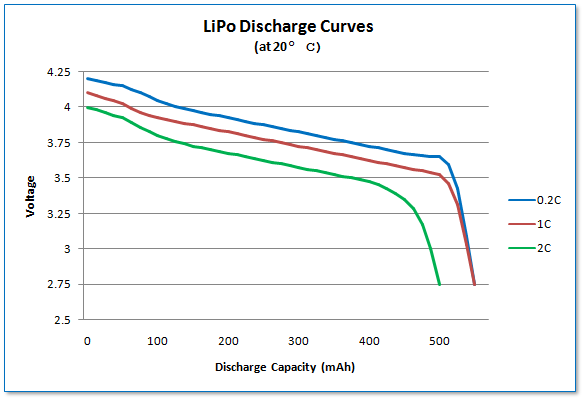 The discharge curves in the graph below are for a LiPo battery at three different loads (rated discharge rate multiplied by 2, 1 and 0.2). 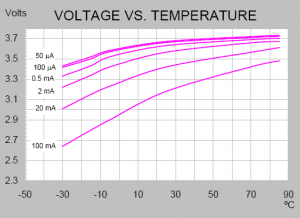 You really need to look at both the voltage at temperature and load graph and the discharge curves to get a feel for how a battery will perform in your application. Rated current – Batteries typically have both maximum continuous current and maximum pulse current specs. These values should never be exceeded. Best case you can severely decrease the life of the battery. Worst case, with lithium based batteries the result can literally be smoke and flames. If your design requires getting close to these rated currents, contact the battery manufacturer to discuss your application to make sure your product will be safe and operate properly. You may also consider using two batteries in parallel to increase the available current (this carries its own set of issues that are beyond the scope of this discussion). Next week I’ll discuss battery charging and several other important aspects of battery selection. This entry was posted in Hardware on September 4, 2013 by Mike. very good information on Electric product i got know useful information thanks for this. Thank you for the comment. I’m glad you found the information useful. Please help spread the word and let others know about the blog.